A new playground is being constructed at Elton Park in Ashby two months ahead of schedule, much to the delight of local resident, seven year old Macy Gallagher. 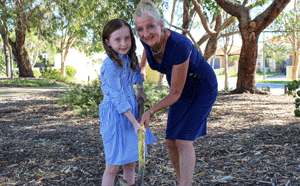 Mayor Tracey Roberts with Macy Gallagher at Elton Park in Ashby. Macy and her mother Maggie contacted the City last year to enquire about the possibility of children’s play equipment being installed at Elton Park as there were none within walking distance from their home. “Macy doesn’t have any friends who live locally and she would often say she wished there was a playground nearby where she could meet some new friends,” Maggie said. The City acknowledged that the area would benefit from a children’s play space and there was budget available in the City’s playground installation program, so concept designs were created and the City asked the Ashby community for their feedback. An overwhelming 83 per cent of people who responded said the playground would be a welcome addition to the area and they would be happy to see their children or grandchildren enjoying the park. “As a City we are committed to providing facilities that encourage a healthy and active lifestyle for our residents and this playground will benefit our younger residents as well as their families,” Mayor Roberts said. Construction will be completed by April.